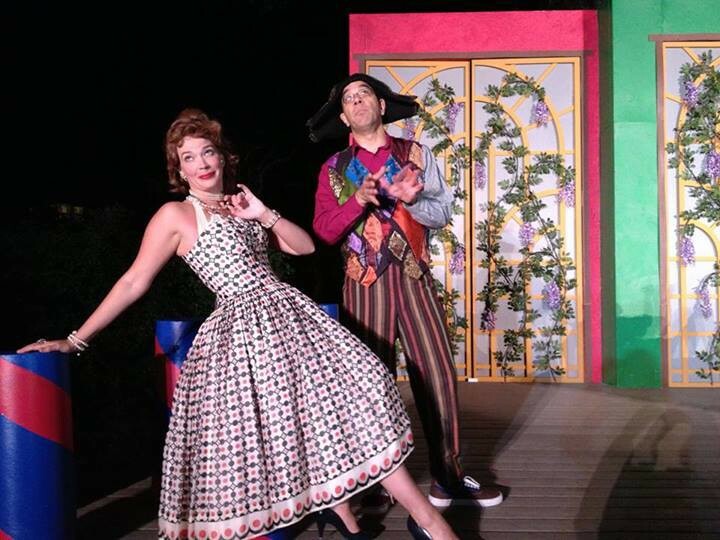 'The Servant of Two Masters' runs Thursdays-Sundays, July 12–28, at Ives Park. 154 Jewell Ave., Sebastopol. 7pm. $7-$20. 707.823.0177. CUTUPS Allison Rae Baker as Beatrice with David Yen as Truffaldino. Anyone allergic to silliness should stay clear of Sebastopol's Ives Park for the next couple of weeks. There, a 260-year-old comedy has landed, packed with pop-culture references (The Wizard of Oz, The Princess Bride), outrageous plot twists (a man dies after falling on a chopstick—13 times), and ridiculous, slightly raunchy dialogue (a woman, disguised as a man, asks for money by saying, "I'm flat busted—so to speak"). The 18th-century Italian playwright Carlo Goldoni wrote over 150 plays during his lifetime, the most popular being Servant of Two Masters. Kicking off this year's Sebastopol Shakespeare Festival is a new version by Thomas Chapman of the Oregon Shakespeare Festival. Loosely based on the 1928 English translation by Edward Dent, Chapman's approach (he also directs) resembles the more-is-less, cram-it-to-the-max, no-laugh-is-too-cheap comedy of the Reduced Shakespeare Company, Saturday Night Live and, most definitely, Monty Python's Flying Circus. The convoluted, twisty-turny plot involves a hungry servant named Truffaldino (David Yen, for whom Chapman fashioned the role), who accidentally ends up employed by two different people at once. Unbeknownst to him (and everyone else), his first employer, the presumed-dead aristocrat Federigo Rasponi, is actually Beatrice (Allison Rae Baker), Federigo's sister, in disguise as her dead brother. Truffaldino's other master is the fugitive Florindo (Peter Warden), Beatrice's secret lover, who's been wrongly accused of Federigo's murder. To raise the money for Florindo's defense, Beatrice, in disguise, hopes to claim the dowry promised to her brother by Pantalone (Larry Williams), whose daughter, Clarice (Jessica Wysocky), was engaged to Federigo, but actually wants to marry Silvio (Chris Sword), the son of the quackish Dr. Lombardi (Nancy Prebilich), alarmed to learn that Federigo is no longer dead (cue zombie jokes). Adding spice to the mix is the potentially cannibalistic innkeeper Brighella (Brandon Wilson) and the love-hungry maid Smeraldina (Denise Elia-Yen), with whom Truffaldino is instantly smitten. In Chapman's hands, the raucous plot is a mere conveyance for a series of outlandish jokes, bits, inspired wordplay and supremely goofy lines ("I don't like being frightened! It scares me! "), with each and every member of the clownish, committed cast pitching their highly physical performances at maximum over-the-topness. Though a tad overlong and a bit overstuffed, this Servant keeps the laughs coming—with plenty of pratfalls, funny faces and snot jokes—right to the giddy, ridiculous end.